Onion topper. Working width from 150 up to 225 cm. Detail of the movements transmission. 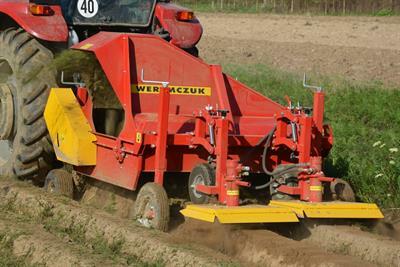 Baselier multi-purpose Hydraulic folding Haulm Topper for excellent topping of potatoes, chicory and carrots. By Baselier based in Steenbergen, NETHERLANDS. By Dewulf based in Roeselare, BELGIUM.